Big, black and heavy - can this Clevo-clad laptop nail the Intel/Nvidia combo? Equipped with Haswell, this Clevo gaming laptop is solidly built and offers plenty of choice at checkout. But we've seen faster mobile rigs. The XMG P703 is our first laptop from German manufacturer Schenker to feature Intel's 4th generation chips. As we say in our in-depth article on Haswell, the chips are designed for the mobile market, with improved battery life and more powerful processor graphics. That means Haswell has a lot to offer Schenker's already successful range of gaming and enthusiast laptops. This XMG P703 is from the Pro Gaming range, which means you get the choice of either the GTX 780M or the GTX 770M we've got in this config. The P703 comes with that 17.3-inch screen, and Schenker also offers the P503 with a 15.6-inch panel, though both come with 1080p native resolutions. The lower-priced Advanced Gaming range also comes in both sizes, but you're limited to a GTX 765M at best. All of Schenker's gaming notebooks are set up with the latest mobile i7 CPUs from the Haswell lineup. This i7-4800MQ is the middle order mobile Haswell CPU offered via the notebook configuration pages. It's still a tasty mobile chip though, with a 2.7GHz clockspeed out of the box and a top Turbo frequency of 3.7GHz with the full Hyper-threading mother lode. There is a huge performance and architectural difference between the two pro gaming GPUs on offer - this GTX 770M and the GTX 780M. Architecturally it's 960 shaders vs 1,536, 24 ROPs vs 32, and a 192-bit vs 256-bit memory bus. In performance terms you're looking at 10fps difference or more. If you can afford it, the GTX 780M is the mobile GPU to go for. Price is such an important factor when you're talking about these sorts of desktop replacement notebooks. The P703 isn't particularly portable, as evidenced by the massive, chunky Clevo chassis. This is no ultrabook. These gaming rigs are always expensive, but if you opt for one that only just plays today's games it'll be woefully underpowered a year from now, so we advise spending most of your budget on the GPU. That's not to say the GTX 770M isn't capable, but compared with the 780M, it's worth the GPU upgrade. Perform some config gymnastics and you'll be able to massage the specs, switching the GPU and CPU, and shifting a few of the other luxuries around too. Those core parts are tough to upgrade later on, if not impossible, but dropping in an SSD yourself six months down the line is all kinds of simple. This P703 spec is solid, if unspectacular. It's far more money than you'd spend on an equivalently performing desktop machine, but for this sort of gaming notebook it's pretty good value. To get the best out of the machine, we'd make those spec changes to weight it in favour of the GPU. 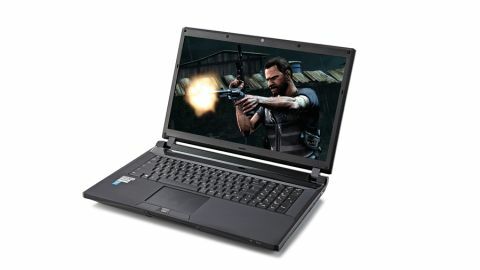 But even with that proviso, the combination of impressive warranty and excellent configuration options still makes this Schenker gaming laptop a very interesting proposition.